India's 100 million tribespeople are, in the words of a historian, its invisible and marginal minority. Despite affirmative action, most of them continue to eke out a miserable existence in the heavily forested, mineral-rich states. More than four million of them, by one estimate, live in protected forest areas, which comprise about 5% of India's total land area. The protected areas include forests and some 600 wildlife sanctuaries and national parks. A 2006 law gives tribespeople and other dwellers living on forest land for three generations before December 2005 the legal right to live and work on the land. What happens to India's four million 'stateless' people? Now India's Supreme Court has ordered that more than a million such families living on forest land will have to leave soon. The top court has acted on information provided by 17 states. The states have carried out a three-step verification of more than four million occupancy claims - each requiring 13 different kinds of evidence - of every family living on forest land. Some 1.8 million claims have been accepted and land titles handed over to families living on 72,000sq km of forest land, an area equivalent to the north-eastern state of Assam. But more than a million claims have been rejected, so an equal number of families face eviction. Environmental journalist Nitin Sethi calls this the "largest mass scale, legally sanctioned eviction of tribals in independent India". Wildlife groups had petitioned the court saying India's limited forests were being encroached upon, and endangered wildlife was being further threatened by illegal squatters on forest land. They believe allowing people to live in scattered parts of forest land is also leading to to the break-up of large forests and fragmentation of the habitat. They say the forest law provides for the resettlement of people living in national parks and sanctuaries, but none of this has happened. "The law is meant for pre-existing forest rights only and thus is not a land grant or land distribution law," says Praveen Bhargav of Wildlife Trust, one of the petitioners in the case. 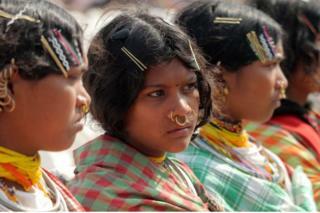 Tribespeople support groups say the implementation of the law has been faulty. They blame overzealous environmentalists and wildlife groups for the present state of affairs. Advocacy group Campaign for Survival and Dignity says numerous official and independent reports have confirmed that "huge numbers of claims have been wrongly rejected and that forest officials, in particular, have a track record of illegally preventing people's rights from being recognised". They blame Narendra Modi's BJP government for "failing to defend the law", and fear that the court order could easily become a pretext for forest officials to "attack" people who live in the forests. There are fears that such a large-scale eviction of tribespeople - it has to be completed by 27 July - is likely to spark widespread unrest in states like Madhya Pradesh, Karnataka and Orissa, where a large number of of them live. Such fears are not unfounded. An earlier eviction drive - between 2002 and 2004 - to rid the forests of encroachers resulted in some 300,000 forest dwellers being forced out from lands, according to CR Bijoy, an independent researcher. Villages were set on fire, houses demolished, crops damaged and people killed in police shootings. "Tribespeople and other forest dwellers become encroachers simply because their ownership rights have not been recorded and settled by officials as stipulated by forest laws," wrote Mr Bijoy in a paper. India's tribespeople, according to historian Ramachandra Guha, suffer from what he describes as a "triple resource crunch", living as they do in India's "densest forests, along with its fastest-flowing rivers and atop its richest veins of iron ore and bauxite". Over the years they lost their homes and lands to dams, mines, and factories. Now a mass court-mandated eviction from forest land, again, proves how vulnerable they remain.